note: the Carefully Calculated Plank Length Based Implosion Sound Tones Below Require the Flash Plug in..to play. And your are warned, they are hazardous. (see below). There is power and hazard in this relatively accurate implosion sound, with it's VERY noticeable disturbing effect. The point is that you do FEEL something, you realize the PHI harmonic cascade effect is real. Please help me to use the impact of this, with all it's hazard, to help me pursuade the academic community that continuing to IGNORE the principle behind PHI IMPLOSION, is much MORE hazardous than this audio test could ever be. Getting "Screwed" may get new PR.. When we first published the info on implosion hazards, The Implosion Phenomenon: Psychological Import of Phi Harmonic Music Phi Scalar Technology & MonoAtomic Gold.. If enough people realize how powerful and potentially disturbing and how REAL Phi implosion is, they may choose to study the REASON embedding by PHI creates implosion. Aside from leading to the solution to cold fusion, and non-linear energy device technologies in general, this sonic PINING points clearly to the nature of consciousness as a charge implosion itself. Perhaps claity in where i'm dealing with indoctrination and true lightwork. Khumara is a ancient peruvian word meaning reptile/serpent/worm.... (derived from the vairachoca- sanat's lineage.. -ref:"Codes of Light" Ayani..
when you have been a worm for this long, you know what makes one wormhole sustainable.. I want to share with you a special experience I had this evening which relates to sacred geometry. transformational education and mentoring, spiritual and personal growth and integral health." appreciate the pauses between the notes which is what its all about. itself through his playing of the piano. and how Beauty relates to the Golden Mean. An open end axisymmetrical cavity is used to study the generation of implosion sound. The cross section of the cavity's profile has a shape which will distort the wave front of a plane shock wave converging it into a single point. Hence, a spherical collapsing phenomenon can be approximately achieved when a shock wave propagates into the opening of this finite size artificial cavity. Through the shock and shock interference mechanism, a strong impulse therefore is generated at the focal point caused by the pressure difference between the inside and outside of the cavity. This highly localized impulse then is radiated out from the opening of the cavity as a sound projector. A prototype model of 0.5 l size has been constructed and tested in the laboratory. The preliminary experimental results indicated that this device can reach a peak sound pressure level of 146 dB//20 (mu)Pa in air and 185 dB//30 (mu)Pa in water, with an ambient pressure of 1 atmosphere (1 bar). The 50% pulse width is about 20 and 30 (mu)s for air and water, respectively. Analysis and application of this type of sound projector will be discussed. " Manfred Clynes -Sentic emotion selected music processing software / 'phrase enveloping' love wave is based on Phi indenting, altho he chooses to ignore the principle. So in order to prove the Phi cascade theory of perfect embedding, let's apply it to actual frequency choices. This will lead us to healing sound and light pure principles, implosion sonics, and 'what is the physics for deciding when a wave is sacred'? Another way to understand this, is to say from our best info in physics if these wave lengths immediately below do not divide evenly into the wave length you are studying, then the wave length you are studying cannot exist! When Gurdjieff said: "life is real - only then when I AM", he meant el-eye phi is RE (latin for thingness but MEANS RE-sonant) ALL.. only then when I AM that I AM..
From the point of view if this physics of where Mind occurs among waves nesting, when RE-sonance becomes enabled RE-cursively embedding, then RE (thingness) becomes AL(l). So we can go back to the question: is there such a thing as a frequency more sacred than others? The answer is clearly YES and calculable. Some do embed, others do not. we can also choose the KEY SIGNATURE! Note here, sadly the below have insufficient significant digits, and these calculations for now are approximate. Yet the principle is elucidated. on Quantization of Space, Time and Mass. This technique takes the known fundamental constants of physics, and converts them into a common dimensional value ..
to all the units of "ratio" (time/length/mass) in which the original 'constant' is expressed. In other words, what unit of length or time is common to all constants, etc. This is a way to see where our clearly arbitrary (non-sacred) units for length and time, become 'sacred' or EMBEDABLE or well nestable into the (recursion tuned) fractal of fundamental waves (the universe itself). The point being, clearly functional wave resonant systems, MUST USE SACRED MEASURE IN ORDER TO EMBED, and create the necessary psychokinetic resonance with all of mass. But now let us apply this hint of the 'perfect basis of musical scale" to some things like..
the history of the frequency of A..
And how would Phi implosion sound be tuned most implosively to the fabric of space time itself? Dear Marysol in her BIOSONIC software, (like most of western music) is just beginning to look at tunings not octave/ or log 2/ or linear based. 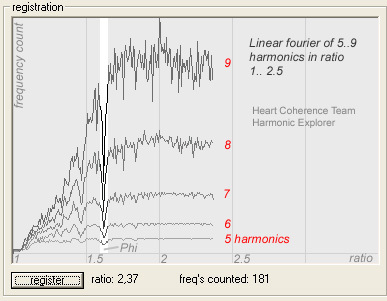 Particularly now as Marysol and friends choose excitingly to look at specific color harmonics, which successfully heal / fill in GAPS in AUDIO spectra from the voice, now would be a good time to look at PHI tuning as well. Using only this octave system we see only which oscillators nest cubically. In a sense we are checking to see where cubic wave nests can touch. This is useful, but there is one tragic flaw. Anytime Mother nature needs wave/energy systems of VASTLY DIFFERENT scales to swap spin/info/energy, THEN SHE MUST USE ONLY MULTIPLES OF GOLDEN RATIO AND NOT 2. You can see why this could have particular value if you were swapping energy between say an optical hologram and a sonic hologram (common in lattice defect non destructive testing). To do this you need a 'non-linear material', which is a medium where all the phases can lock. (See "Phase Conjugate Mirror" and negative time. some comment at ../cancer ). This is exquisitely why in Mother Nature's DNA/EarthGrid/Zodiac (and Gold and Palladium valences) are all based on the nested Dodeca stellations inPHIknit PHI/Golden Ratio series). So again, this excersize in locating which actual frequencies can stand as wave / embed (eck in stasis - ecstacy), is useful.. Worthy of ATTENTION! then we divide it by phi^190 power to bring it into the audible spectra. This produces one tone, establishing a key signature for implosion sound chords, based on exact multiples of Phi times the Planck unit of time. Further work should be done here showing certain key points where the logs or multiples of 2 (octave) actually overlay the logs of phi. These would be sacred wavelength/frequencies as well. 1.063 cycles per second, hertz., above might be corrected..
>problem solved by Golden Mean. "sacred", Golden Mean here is irrelevant in the context of any implosion etc. science as there is no cascade. cepstrum scale - this suggestion is NAIVE and scientifically wrong. where G is the universal gravitational constant, h is Planck's constant, and c is the speed of light. maybe the heart feels happy settling at such Golden Mean multiples of the Planck time? I suggest a heart rate averaging function in the heart tuner software to verify these rates. Please note below, these carefully calculated Phi chord implosion sounds are hazardous, disturbing, and should be used with caution. To play them, you must have the Shock Wave Flash (swf) plug in. (Free at Flash Plug in. ). Instructions, simply dragging your mouse over each note plays it for 2 seconds. Drag over several notes (pure sine tones) at a time to play different chords. If your computer is not connected to good audio, particularly the lower tones won't play well. Please be attentive to feelings of disturbance (in my case nausea) in the solar plexus. wave velocities until a worm thru lightspeed is created). If I am emphasizing how dangerous this is, why do I publish this? Several important lessons need learning here. Here is what I suggest will happen with this sound experiment. Insensitive people will feel nothing, and choose to play it loudly and 'tear' their environment (magnetically as well as sonically). Sensitive people will go inside their heart and choose to learn to make their own sonics. And feel a tingle. They will choose to to play the sound responsibly. Yet on a planet threatened with total implosive solar annihilation, the LESSON MUST BE LEARNED. All non-compressible structures (genetic/emotive/geomantic) WILL suffer heat destruction. Until the PRINCIPLE of fabricating the truly compressible and therefore shareable wave structures is learned, our collective genetic memory is at a great survival risk. That is why I am sharing this what I consider to be a dangerous principle. Better we should be vaccinated. As I sit here having only played the result of my new audio programming into flash here about 3 times (at lo volume). I am already feeling disturbed, restless, quivery in the solar plexus, and NOT happy. I suggest to you that a similar thing happens whenever a strictly mechanical means is used to create implosion. Gold powder, (ORMES) as an inorganic source of implosion in the blood and immortality is an example. Moving up on the scale, microhydrin is more organic, but still well down on the scale from the quality of implosion available in say the menstrual blood of a spiritually healthy young woman. (I am sure breast milk colostrum fits in here somewhere as well). More in Gardner's writing on seratonin/, melatonin sources. So with non self aware / non- organic / non-glandular implosion comes a wormhole squirting PAINFUL magnetism into 'the continuum' (gravity eros bloodstream of Earth /Solar...). An extreme case for example is the catastrophic tear in the fabric of time which was created at Montauk, used deca/PHI geometric capacitors to acheive this superluminal (time embedding) magnetic launch. The Templar incarnates today (William Buehler et al for example) invest huge effort in trying to heal this 'fabric of time' with the re-weaving of recursion magnetics organically ( see Reshel Grid). Tears in the fabric of time, occur for example when spinning a simple copper dodec under a tree irresponsibly. Another example would be installing the dimple imploding LABYRINTH in a place where the elementals ask you not to. They know where magnetic blood needs to squirt between worlds, and where it would be painful. On a large scale this un-conscious wormhole making/ geomancy scambles the feedback corridors that allow souls to migrate at death, and enter soul groups etc. The infesting leakage of large numbers of Khumer or "Grey" ET's into Earth's aura was partly due to the time tears at Montauk, said to have been an intended result by Chief Draco there "Charlie"?. Natural -self-aware implosion fabrics it's own self-not-self membrane. This keeps out abduction. This is the key to immune systems, bio-acoustic habitat theory, signature sound etc. The challenge is there is a whole raft of hygiene required to make this sustainable in DNA (Nourished By Spin; Twinkling Eyes Lifestyle... 'all human interactions are about CHARGE' -Celestine Prophecy. Fusion-Phi Phenomenon-Unlocking Ultimate PHIre. , --: Seeing Stars - the Holy Grail of 'Cold' Fusion, & the Palladium Dodeca..
we will be TIME WORMS ourselves, less in need of 'swiftly tilting planets'. Where is your Tesseract (unpack cube in 4D=Dodec?) when you need it? could have a "Jelly Bean"
A: GOOD IDEA! Howie... recommend - Keeper of the Holy Grail MUSIC playable at link.., Dan. has tested ways to use COLOR to replace missing SONICS in EKG harmonics and VOICE..
etc. using training in sonic interference. could be interfering was inside the liquids of the brain itself..
so then they began to look at the geometry of the effect on brainwaves..
difference/ descrimination / separateness barriers..
up .,., in the 2 hour documentary he filmed at my farm..
WOULD BE THE TOP CENTER ..! the SAME PHI harmonic cascade in the EKG at moments of bliss/ love..
to eliminate addiction / attention deficit..
part of his eeg work to prove that part..
surely we need to build some phi log math into that software?? HOW DO YOU PROPOSE FOR US TO DO THIS? even sherry edwards voice had the necessary warble at the key moments..
optical cams and other speially ground glass and prisms. performance of the dove prism is with an input of collimated light. with a dove prisim/lights and images in software? If the dove turned fast enough the mirrors sites would potentially be the same shape as the pine cone wave nodes pictured above. collission annihilation mirror in non-linear optics famous TIME REVERSING - PHASE CONJUGATE MIRROR..
time... 06/08/1999 http://www.dera.gov.uk/html/electronics/phase_conjugation.htm "The phase conjugate of a wave possesses exactly the same spatial properties as the original wave, but it is said to be reversed in time. This means that a phase conjugate wave exactly retraces the path of the original beam. This has the useful property that if a light beam propagates through a distorting medium, and then the phase conjugate is produced, this phase conjugate exactly retraces the path through the distorting medium. This enables the unfavourable effects of distorting media to be reduced or eliminated. generated acoustic waves which possess hypersonic frequencies (of a few GHz). These waves are highly damped and form a grating which then acts as a phase conjugate mirror. Phase conjugation can be used to make double pass amplifiers that do not distort the original beam structure. This can be done by sending a beam of the desired profile through an amplifying medium, so that it hits a material that acts as a phase-conjugate mirror. The phase-conjugate mirror sends the beam back along the original path and back through the amplifying medium. The light recombines in its original profile once it has passed through the distortion. This technique is currently used in a small number of commercial laser systems. One problem is that single-longitudinal mode (SLM) lasers are required, this usually adds to the cost of these systems, making them unattractive. amplifiers in series can lead to damage problems. However amplification using parallel amplifiers can help reduce this damage problem & make it easier to upgrade to higher energies at a later date. There is a problem however, if separate phase-conjugate cells are used. The returning signals posses a random phase shift since the phase-conjugation process occurs at different relative positions within the cells on a purely random basis. The phases must therefore be locked together. DERA has several techniques for locking the phases in such systems which could potentially be useful for high power laser systems. Phase conjugation therefore has benefits for industrial laser companies interested in improving the performance of their systems." list. I wonder if you could shed any light on it? about? It was a 3D hexagonal structure. but I'm no maths whizz. A football (soccer ball..I'm a Brit) I think is made up of Pentagons? i.e. all panels are pentagons and sewn together to make a sphere. Imagine the pentagons being flat. I think that is a possible 3D shape? But, in the same vein is a 3D hexagon with flat panels a possibility? was kind of scary at the time seeing a non physical thing as it were. >so we can leap from there easier than we think? Weird co-incidence. maybe not even relavent. understanding of the golden ratio. Never knew this stuff existed. a resonance that is familiar. this image I refer to came up during a spontaneous Kundalini awakening. cropped up there, or one of the others. 3D hex spinning cube. This came later in my awake thoughts. Q. What is Metatron''s cube? a hex view! The dodec is door to next axis of spin or dimension. Am I correct now in this Dan?? ?